Windows 10 *Windows Server 2012/R2 & 2008/R2 support is for the full family of operating systems including Server Core and Hyper-V server. Protect your files, folders and applications with a flexible image backup that can be used for both data restores and disaster recoveries. Make Data Containers smaller than 2TB as required. Up to 30% faster backups than in previous versions of BackupAssist when using System Protection. Make image backups to USB Hard Drives bootable, for simplified recoveries, using our new Bootable Backups feature. Secure backups AES encryption, with support for 128-bit or 256-bit using Bitlocker. Whereas the in-built wizards in Server 2008 only support USB HDD, BackupAssist supports USB HDD as well as NAS, Local disk, eSata disk, rdx drives (such as the RD1000 and QuikStor) and Iomega REV. In addition, BackupAssist allows you to see the contents of the backup device (it keeps the drive letter), and it manages things like "Safely remove hardware" and "Add new hardware" to both eject and inject devices to make sure that the backup runs. Additionally, it will also cater for situations where a USB drive's drive letter changes. The concept of media rotation involves having multiple backup devices in a "pool", and swapping these devices onsite and offsite. The purpose is to have a variety of restore points, and to have them stored in different physical locations. Unfortunately, the Microsoft wizards provide you with absolutely no help in managing this process. In contrast, BackupAssist contains numerous important features that help maximize your backup’s effectiveness by minimizing human error and enhances the reliability and effectiveness of the entire system. Best practices at the click of a button. Specific instructions sent to the backup operator. Checking is done every night to make sure that the backup devices are rotated according to plan. If the wrong device is connected, BackupAssist can be configured to either backup anyway and display a warning in the backup report, or to abort the backup altogether. Finally, as the new Windows Server Backup infrastructure is image based, it does not support backing up specific files and directories, whether they be local or remote (via network share). However, BackupAssist provides a solution for this - within the product (and at no extra cost) is our File Replication Engine - a separate backup method that allows you to copy files, complete with VSS support and full NTFS security / extended data stream support, from any location to any other location. There are two methods of restoring data from a Windows 2008 system. 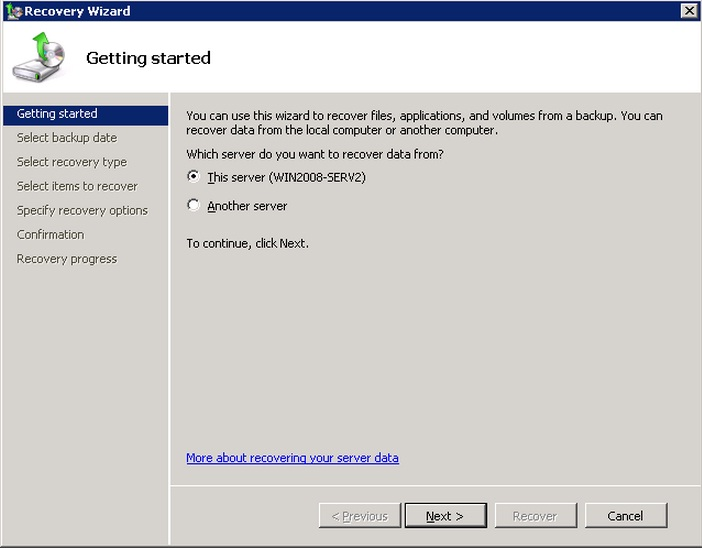 The first method is to use the Windows Server Backup Recovery Wizard to mount an image and restore individual files or entire volumes. A simple wizard (pictured to the right) is provided to make this process easy. The second method is for a bare metal restore - use the Windows DVD (or a recovery CD) to perform a restore from your image. This is an automated process - simply configure a few simple options and Windows will automatically rebuild the system.